Security cameras record man urinating in Sheba Medical Center synagogue, desecrating holy books. 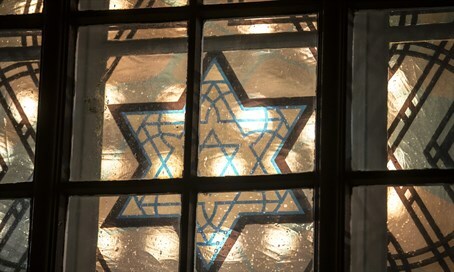 Visitors gathering to pray at one of the Sheba Medical Center’s four synagogues were aghast when they discovered the house of prayer had apparently been defiled in a shameless and grotesque manner, Yediot Ahronot reported. Worshippers found that the front of the synagogue smelled strongly of urine, and that a number of prayer books were damp. After contacting hospital security, the worshippers’ suspicions were confirmed by a review of the synagogue’s closed circuit television system. The security camera recording revealed that a man, who appeared to be in his early 50s, entered the synagogue on Wednesday, exposed himself in front of the ark holding the Torah scrolls, and urinated on holy books. Hospital administrators acknowledged the incident and say that police have begun an investigation. Footage of the incident was leaked to social media, sparking a public outcry. Some commenters suggested a public campaign to shame the man involved in the incident by publicizing his picture. “We must publish his name and his picture so that everyone will know who the terrible man is. Maybe if someone sees his picture, he or she can identify him and (help) the police can arrest him."